Fresh Domestic Boletes Mushrooms, they grow wild. Not to be mistaken for imported European Porcini, these have a lighter and more mild flavor and aroma. They are known in most countries, and each has a different name for them. This is a great mushroom. It looks like baked bread on the cap. We must slice them in half to inspect for pests. We cannot be 100% sure that they will be free of pests. This is a perishable item and it must be refrigerated upon arrival. We suggest putting them into a strainer in the product compartment in your refrigerator. Do not store in plastic, they need air circulation. We carry frozen european porcini and frozen domestic porcini. The porcini is also known as boletus pinophilus, *Ontto txuri or "the blond", hřib pravy, cep, vargánya, vrganj, borowik szlachetny, baravykas, belyj grib "white mushroom" or borovik, dubák or hríb smrekový, jurček or jesenski goban, hrib or mânătarcă, manatarka, herkkutatti or "delicious bolete", harilik kivipuravik or "common bolete", Karljohan or stensopp, steinsopp, Karl Johan or spiselig rørhat, eekhoorntjesbrood, vrganj, Steinpilz. It is also known as khubz el a'a or "crow's bread". 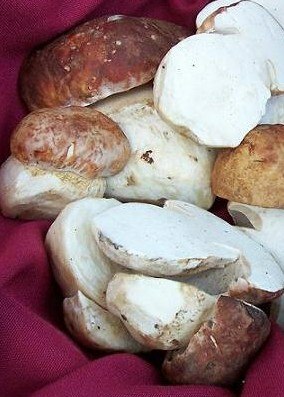 * The flavor of the porcini is excellent, and most people consider it superior in flavor and in texture. It is described as nutty and slightly meaty, with a smooth, creamy texture. Porcini are eaten and enjoyed sautéed with butter, barbequed, ground into pasta, in risotto, in soups, and in many other dishes. If you have never tasted a Porcini, now is a great time to start.